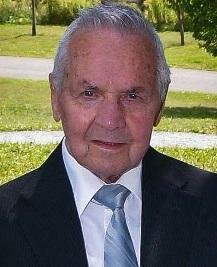 It is with great sadness that the family of the late Edward Buckle announce his passing on Saturday, January 12, 2019 at Western Memorial Regional Hospital in Corner Brook, at the age of 90 years. Leaving to mourn with fond and loving memories his wife Marion; children: Cindy (Cecil), Terry (Huena), Danny (Wendy), Debbie, Jackie (Harvey) and Ed (Paula); grandchildren: Kyle, Robert, TJ, Christina, Matt, Danielle, Brad, Devon, Leah, Lance, Tara and Jillian; great-grandchildren: Juliet, Nathan, Zoey, Emily, Jordan, Bree-Ella and Wyatt, nieces, nephews, brothers and sisters-in-law, other relatives and friends. He was predeceased by his parents William and Mary; parents-in-law: Albert and Mary Neville; brothers: Kevin and George; sisters: Nel Kelly, Laura Penney, Mary Moulton, Joan and Marg Buckle. Visitation will take place from Fillatre’s Funeral Home, 4 St. Mark’s on Sunday, January 13th from 7-9 pm and Monday, January 14th from the hours of 2-4 and 7-9 pm. Mass of Christian Burial will take place from All Hallows Parish, Humber Road on Tuesday, January 15th at 10 am with Father Edward Terry officiating. Followed by Cremation. As expressions of sympathy, flowers are graciously accepted or donations may be made to a charity of one’s choice.